Here’s the latest image of our baby! The ultrasound was taken at 18 weeks and 4 days. We’re now at 19 weeks and 3 days in our pregnancy. So far the baby is very healthy and growing the way it should. All our pre-screen tests came up normal, so that was good to hear. We don’t yet know the gender of our baby. During our last ultrasound, the baby had its legs up high but the umbilical cord was running right between them, covering any chance of seeing if we’re having a boy or girl! Since there’s no “medical” reason to get another ultrasound, we’ve decided to get the “entertainment” ultrasound. Basically they call any ultrasound that just looks for gender an “entertainment ultrasound.” This is one you need to pay for yourself. Given that, we decided to have fun and get the 3D option. We’ve booked a 3D ultrasound on June 22nd (23 weeks in) to see the gender of our baby. Right now, I’m feeling pretty good. Some of the pain and discomfort I had during the first trimester has passed. I still have difficulty sleeping, not being used to sleeping on my side plus the added weight of the baby causing some pain in my hips. I get very uncomfortable sitting and working through the day, so that’s been a challenge too. I’m growing more quickly now, so we’ll see how that changes as I get bigger! 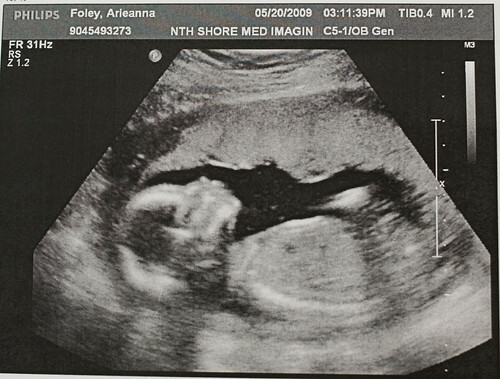 THere is only one thing in the whole world that makes me want to be pregnant again, and that is ultrasound pictures. I’ll be sleeping on the couch for a MONTH now. Damn it, that’s a cute little baby. Congratulations. I remember those days and how excited you must be. Enjoy every minute as it goes by at warp speed! You look so comfortable in there….. I am so looking forward to know you, hug you, kiss you,love you forever and be your grandma…. It was lovely to see you Arieanna, and awesome to see the ultrasound photos!